WATER CONDITIONS: French Broad River was clearing up, but since the recent heavy rain, expect chocolate milk for at least a couple days. This muddy picture was taken Thursday evening 4/26/12 near Long Shoals. FLY SUGGESTIONS: Crawfish Patterns, Clousers, Poppers, Green and Black Streamers. 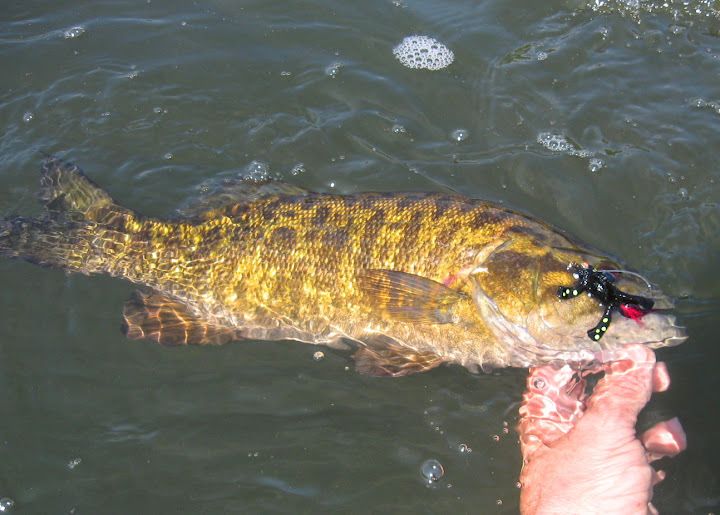 GENERAL INFORMATION: Smallmouth Bass can often be found in sections of river where plenty of underwater structure is present. Rocks, trees, bridge pilings etc. are fishy locations to focus on. Depending on temperatures, fish will fluctuate between deep pools and shallow water. Work the seams and deep pools with plenty of weight to get your flies down. The faster the current, the more weight you’ll need to get your rig down fast. In the warmer temperatures, try throwing poppers to the banks and under over-hanging tree branches. PROJECTED CONDITIONS: Rising temperatures as the week progresses will turn fishing back on in the mornings. Typical scattered showers are in the forecast. As soon as the water clears to 2′ visibility, the green light is back on and fishing should be at it’s annual climax! Rod: 8’6”–9’ 6wt, Fast Action comparable to Scott “S” Series rods.